When he was 9 years old, my grandpa got shot in the cheek while playing cowboys and Indians. He told us this story over and over, showing us his gold tooth that replaced the one that got shot out. I made the story into an illustrated storybook for my children. 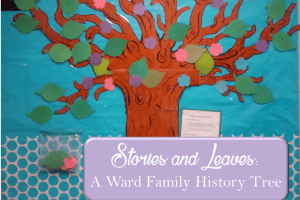 I’m going to share how I did it today as part of our “Family History for Children” blog link up. This month’s theme is about creating family history related gifts, since Christmas is coming up and if you’re going to make a book for Christmas, you’ll have to get it ordered by midway through November. 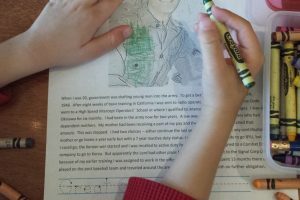 I’ve written before about making your family history book kid-friendly, a project I undertook when my dear friend and neighbor showed me their big volume of family history. I used the StoryBoard That website, which does an adequate job of helping non-illustrators like me create simple characters and backgrounds to go along with just about any story. This year, I found a new company who has talented illustrators create beautiful artwork for your family story called Cuento Books. I am hoping to try this soon. 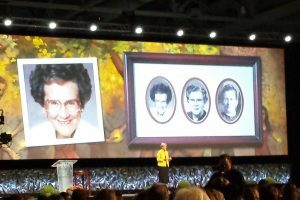 Also, at RootsTech Family Discover Day, Sister Wendy Watson Nelson shared how she recruited her nieces and nephews to illustrate a special family story to create a book! First, my mother wrote the story out in as much detail as she could. You can read about how she did this here: The Adventures of Cowboy Bob: Getting Shot. She did some research into the time and place when she wrote the story, so that really helped me when I went to create illustrations and settings. Next, I looked at photos of the characters and interviewed my mother about their features. What color hair, eyes, stature, etc. This was really useful when I was creating the characters! At the end of the storybook, I had a special page with a photo of each character next to the illustrated character. Next I decided how many pages I wanted for my storybook. With bookmaking websites, the price changes after a certain number of pages. I decided to stay close to the minimum number of pages, about 20 pages. That meant I needed 10 sections of text and 10 illustrations. I paid for a subscription to StoryBoardThat.com so that I could create a larger storyboard and download the images when I was done. It’s about $9 per month. You can use StoryBoard That for free before you decide to subscribe and make smaller storyboards, but without a subscription you can’t download the high quality images of each storyboard cell when you’re done. I went to StoryBoardThat.com and created a ten cell storyboard. Then I put a description under each one of what the illustration would be, to help me remember. Next I chose the background, added characters, and added props. You can customize the eye and hair color, pose, and facial expressions of the characters. You can choose between characters that are wearing old west clothing, colonial clothing, and other historical costumes. One of the great features of StoryBoard That is the ability to copy and paste characters from cell to cell. Once you have created the character once, you can move him to the next cell and adjust the post and size. You can also copy and paste backgrounds and props. When I was finished with my illustrations, I downloaded each cell as a high resolution image, and uploaded the images to Blurb.com’s book making software called BookWright. I then added the text and the images in the order I wanted and created a cover. Here are photos of each page of the book so you can see how I set it up! Enjoy.